Whirlwind Sprint is a shout that causes you to rush forward at great speed. It can be used even if you are overencumbered. This shout carries you horizontally, so do not use it to go down slopes; you will find yourself in mid-air when the sprint ends. Volskygge: Climb your way to the evil of Volskygge. Escaping a much stronger enemy. Jumping to an area enemies cannot reach in order to hit them with ranged attacks without retaliation. Escaping from various glitches that cause you to get stuck in the scenery. Faster travel, particularly when overencumbered. If you hold an object against any locked door or hidden path to another cell and use Whirlwind Sprint, you will jump into the holding space behind the door or path. There is no way back except by use of the console, or if the lock is actually pickable. This glitch is best used on doors blocking access through to the same cell, (i.e., no loading screens normally required). Bypass floor traps and triggers, and avoid swinging blades. There are many hidden areas that are only accessible via this shout (or the Vampire Lord's Bats power). This is only a list of places where valuable loot can be found. Ansilvund: Outside Ansilvund is a tower. From the rocks above the entrance to Ansilvund it is possible to jump to the top of the tower and access a high-leveled chest. Ustengrav: In Ustengrav Depths above the waterfall, there is a series of broken pillars that can be used to access a hidden room with a skeleton and some leveled potions. Yngvild: Midway through the caves there is a large circular shaft with a central column; behind the column is a locked chest. Nchuand-Zel: In the Nchuand-Zel Excavation Site, there is a large, egg-shaped room at the west end of the local map just before you encounter the first spider. In the northwest corner of this room, you can jump up onto a wooden structure, then climb up the rocks sticking out of the wall. Once at the top, use Whirlwind Sprint to cross over to the crippled stonework ledge for a small unlocked chest. Shroud Hearth Barrow: In the last area in Shroud Hearth Depths, to the left of the word wall, there is a collapsed bridge that leads to several items. Reachwater Rock: There is a chest on the ledge of the main chamber opposite the entrance to the crypt. The two-word version of this shout gives you the highest amount of distance traveled per second of recharge time. To elaborate, the one-word version allows you to travel 2.5 feet per second of recharge, the two-word version grants the best distance of 3 feet per second of recharge, while the three-word version provides a slightly shorter distance of 2.85 feet per second of recharge. While there are three word wall texts for this shout, only two of them will appear in any single game; the Greybeards will teach you one of the words. If used while swimming, upon exiting the water, or jumping, as with all shouts, Whirlwind Sprint will immediately activate. This allows for a quick boost should you jump out of water, sending you the normal distance in whatever direction you are facing when you exit the water. This also may cause undesired effects if you unintentionally use it and exit the water. To counteract this, just before exiting, simply jump in the opposite direction you intend to go. tempest in [the] Sea of Tears. When using Whirlwind Sprint in certain ruins and dungeons, it is possible to clip through a stationary object and become trapped behind it. For instance, using Whirlwind Sprint near a bookshelf or cupboard will cause you to travel behind it and be unable to move out of that location. Using the console command tcl will allow you to move back into the movable area. Sometimes when this shout is used, the sound effect of your character shouting will be delayed until you finish dashing. 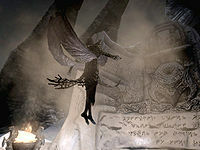 After learning the first word of this shout from the Greybeards, but before they bow and give you the knowledge to use it, you can enter the menu and unlock it yourself with one of your own dragon souls. If you do this, the second word will be prematurely unlocked once you do absorb their knowledge. This page was last modified on 24 June 2018, at 17:43.